It has been a whirlwind of a week in Istanbul and I've hardly had a moment to catch my breath and share the delightful sights I have seen and enjoyed. The city is filled with so much history and culture and there is no way I can capture all of it in any of my posts. Istanbul that we had the joy to experience! the water looks rough, but it's a neat shot! What a busy bustling harbour .... You have captured the ongoing movement of this amazing place. The boat on the water, yuk, it seems that is choppy, great photo. I love that bustling harbor! What fun! Look forward to more photos of Istanbul! Another one of those places I wanted to visit while I lived in Europe, but didn't make it to this one! Terrific capture for the day! Enjoy! the colors are so vivid...would love to be on the water....glad you are having fun! Lovely shot of the boats and water. It is neat to see your views of Istanbul. Thanks for sharing your trip. Have a great time and week ahead. What a wonderful shot. Love the life shown in the water. This is a wonderful picture, a prelude to even better ones, I know. Have you told me what your husband does that he travels all the time? You are so lucky! How exciting to be there. I am happy you are posting the pictures so I can feel like I was there with you. I assume you were on the water to take this shot. Your profile says sailor but surely you didn't all the way over there. So looking forward to that. And glad you're having a wonderful time, my friend! Wow, what a boat and the color of the water is wonderful Cerulean Blue! I can't wait! You r trip has been so exciting to me! Reena, you really have the coolest adventures--THANKS for sharing it with us!! This looks like a painting. Beautiful. Yes, no way a small camera can keep the whole Istanbul, and its soul. Now that is an AWESOME capture!! LOVE it! Love that sunset glow on the horizon. The water is a bit choppy so that gives the photo a lot of character. Looks like crazy fun, enjoy. This is thrilling for me, Reena. I hope we can take our kids back there one day soon, where they lived three years of their little lives. What a gorgeous scene. You've rendered Istanbul magical! sounds like a perfect trip... when do you get home? It looks like there's a lot of activity on the water. Lovely photo. Wonderful enjoy your trip! Looking forward to more photos! My cousin is a flight attendant for Delta and has brought back beautiful items for us from the bizarre! I am loving the houses on the hillside. So European. Reminds me of Italy. Looking forward to the rest of your photos! For some reason the colors in this photo, the green sky and blue water, say Istanbul to me! Can't wait for more! The bustling busy city, colorful panorama from the tower to the streets. 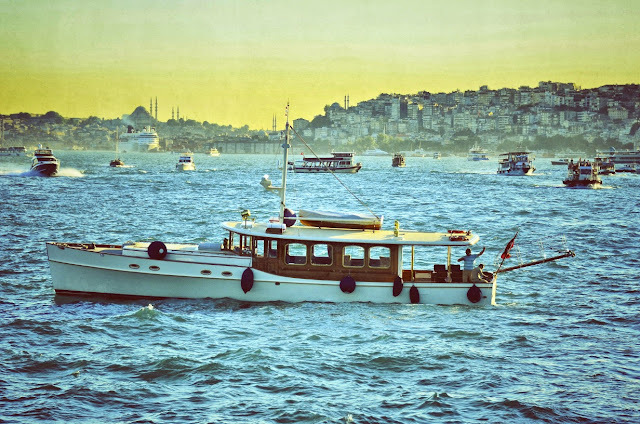 Thank you for sharing your wonderful pictorial narrative of Istanbul.